In a small continent, where does one go to experience the most stunning landscapes? Tamadaba Natural Park is Gran Canaria’s best bet. The oldest and biggest forest in the island is also the home of thousands of endemic plants and animals. Venture into its tree-lined hiking trail and be rewarded with the most breath-taking views below and of the neighboring island. In these parts of the earth, travelers can be alone with their thoughts, with nature’s hidden wonders keeping them company. Parque Natural Tamadaba is a network of valleys, slopes, and mountains on the far west of Gran Canaria in the Canary Islands. 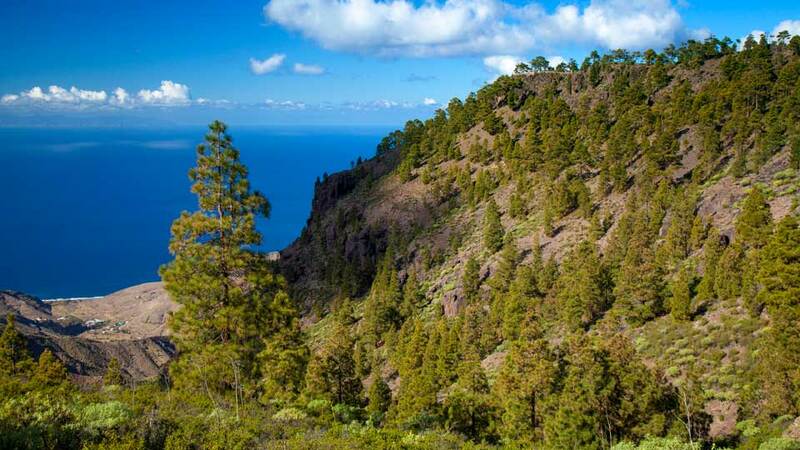 The 7,500 hectares of land starts from the town of Agaete in the northwest and extends down to the towns of La Aldea de San Nicolas and Artenara. Each trail to its peak is defined by pine forests and arid grounds, sometimes steep, sometimes gravelly, but the views are always divine. The park also covers 18 kilometers of the island’s west coastline. Furthermore, the trail from the coast is as magical as the rest of the trails from the towns inland. Pico de Bandera, its highest peak, is more than 1,400 meters above sea level. Thus, many parts of the area are viewing points where visitors could see the Teide volcano in Tenerife peeking through clouds. It is surely a scene to behold despite the fact that the island is over 100 kilometers away. The area is also part of the list of places in Gran Canaria which earned the UNESCO Biosphere Reserve qualification. So, when hikers climb the dangerous cliff off the west coast near the Guayedra Valley, it’s not surprising to find endangered plants and animal species native to the island. In Tamadaba Parque Natural, every cascading valley and mountain kissing the passing clouds spell out tranquility. With lots of things to do and scenery so grand, it’s a destination where families, couples, groups, and individuals surely love. 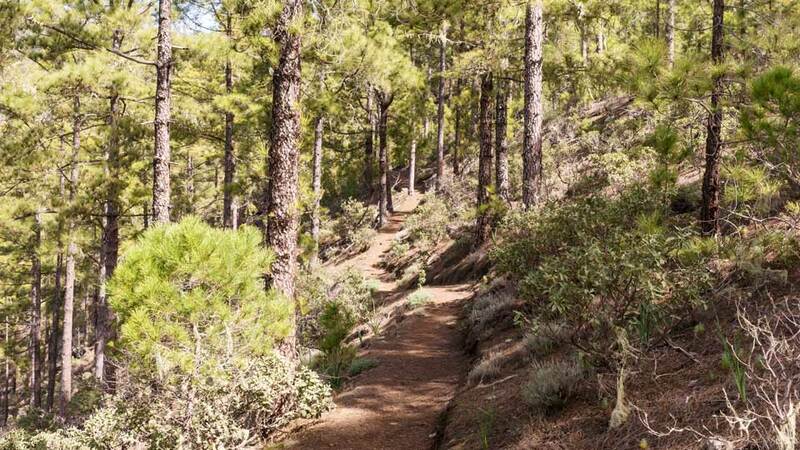 Visiting Tamadaba Natural Park, Gran Canaria’s largest pine forest, is like entering a realm far, far away from tourism. There are plenty of activities to keep adventure seekers, nature lovers, and even wildlife enthusiasts happy and entertained. Since it largely covers three main municipalities, there are plenty of hiking trails found in the natural park. Following the wooden signs from the town of Agaete to Artenara, hikers get a front-row seat to the views of the villages below, spreading throughout the foot of the mountains. This trail is almost parallel to the motorway GC-216 going to the park. Regardless of which trail, visitors only need to look up to see the enormous pine trees or look down to spot the beautiful arid, pine needle-lined grounds. The stunning views of cascading mountains and valleys, often kissed by thin cloudy mist or showered by the sunshine, is a sight to behold. From here, one could also marvel at the height of the famous Teide Volcano in the neighboring island of Tenerife. A steep trail, but easily accessible by car, run to the west coast of Tamadaba, through the cliffs in Guayedra, where Mirador del Balcon lies await. From this vantage point hanging on a cliff, hikers feel like a king or queen on the top of the world. In front of Mirador del Balcon, the blue waters of the Atlantic spread as far as the eyes could reach. At the back is the vast expanse of La Aldea de San Nicolas and the lovely green La Arena Valley. On the cliff side is the famous “Dragon’s Tail,” a wall defined by sea cliffs running zigzag. Those who are not keen on walking or hiking could still get to enjoy the beauty of Tamadaba. In this case, they could rent a car and drive to the main camp and viewing site, and delight in the tranquility with only the winds and the sound of chirping birds in the background. The pines also provide ample shades for families who would like to have a picnic amidst nature. Unlike the nearby parks of Roque Nublo and Tejeda, the place is not frequented, making it a secret haven for those who wish to take a break from the beach and the city. The pine forests, lush valleys, and dangerous cliffs of Tamadaba are not only for the eyes. Within these reserves are shelters for endemic plants and animals. Endemic species of flowers and trees abound in its mountains, the most notable of which is the native Canary pines. Each takes its part in completing the picturesque scene for visitors. Guests could also take the rare opportunity to snap a shot of some of the wildest birds on the island. Some have seen woodpeckers and the Blue Chaffinch. Considering that the area is also a Special Bird Protection Area, that is not surprising. Tamadaba Natural Park offers more than one viewing points, and since the park area stretches to three municipalities, there are many ways to get to these miradors. When driving from inland, take GC-210 to the left side of Artenara. Get off and drive through GC-216, a one-way road which would take visitors around the middle and into the main viewing camp at the highlands of the majestic reserve. If driving from the northern village of Agaete, take the winding mountainous road down GC-200 passing through Barranco Guayedra. It would directly lead to Mirador del Balcon. The breeze from the west coast and the beautiful hamlets and lush green ridges make every second of the drive enjoyable. For those coming in from the south in La Aldea de San Nicolas, the choice can be to drive up through GC-200 to the west for the cliff and ocean view. Another option would be to go through GC-210, then to GC-216 to the east, for more of the ravines and pine forest views. From the bus station at Las Palmas, take Bus No. 102 which would go through Platform 3, at Galdar, and then at Agaete. The buses leave every hour to take passengers to Valle Agaete. Once in the village, the stop at El Lomo is where hikers could start following the Camino trail to Tamadaba. There are several other trails from the three municipalities which lead wanderers to the lovely Parque Tamadaba. They just need to follow the wooden signs, from wherever they are staying. All efforts are rewarded by the pristine scenery, the fresh and crisp wind, and sometimes a magical cloud enveloping the hills. Depending on the weather, some parts may have very humid air and dry grounds while others may have colder temperatures and misty paths. Proper hiking clothes are thus advisable. With half of the island of Gran Canaria classified as UNESCO Biosphere Reserve, it is needless to say that the nature parks here are outstanding. It would be such a waste not to leave the beaches at one point and head up the hills to witness its splendor. Tamadaba Natural Park is the biggest nature reserve where the island’s rich biodiversity is free for everyone to see. Drive, take the bus or follow the walking trails to experience its serene sanctuary. Be prepared for the spectacular views of the Atlantic, valleys, cliffs, fields, old villages, and rejuvenated by nature’s majestic beauty.